This book is a must read for any expecting parents! We offer this book at low cost to encourage you to purchase a copy and give them away. 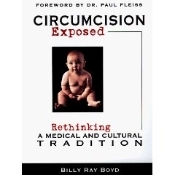 We make this book available on our site to help educate, in a written format the origins of circumcision, how devastating the results of circumcision are on the child it is inflicted upon, and how it affects a man later in life. We encourage you to give a copy of this book to any expecting parents prior to the birth of their child so they may educate themselves on this issue. Emotionally literate, culturally sensitive, yet fearless exploration of why the United States is the only country in the world to circumcise its baby boys for supposedly medical reasons. By Billy Ray Boyd, with a foward by Dr. Paul Fleiss MD. This book in no longer in print, and copies may be new or used at our discretion.